We’re excited to announce that we’ve teamed up with Avery WePrint to give our customers an easy way to get custom printed labels for industrial aluminum bottle products. Our customers now have access to premium, professionally printed labels with low minimum order quantities and no set up fees or plate charges. These labels are perfect for labeling industrial bottles containing flammable and toxic liquids, solvents, gasolines, raw materials for fragrances and more. Creating OSHA compliant labels has never been easier. Easy to order & reorder online & your satisfaction is always 100% guaranteed! 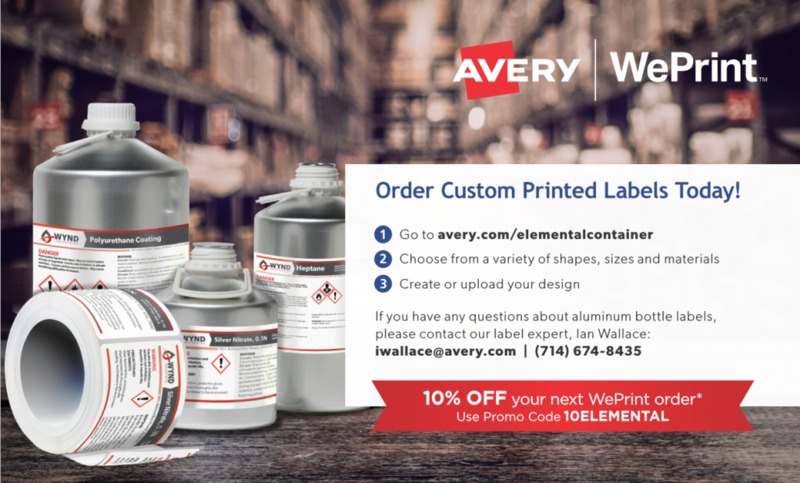 Get 10% off each order simply by visiting Avery WePrint, and use the code10ELEMENTAL to redeem your discount.